WEST LAFAYETTE, Ind. 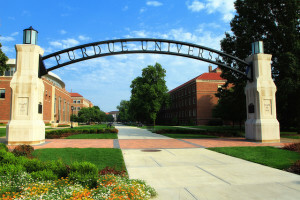 — Purdue University is under fire after it refused to engrave language about God on a donor’s plaque for fear that it might be considered a government endorsement of religion. Dr. Michael McCracken and his wife made a donation to the university in 2012, and was asked to provide an inscription for the dedication plaque, which was to be posted at the recently renovated Herrick Laboratories. Last October, university officials informed McCracken that it would not be utilizing the submitted language as they wished to avoid the appearance of promoting religion. McCracken then contacted the Texas-based Liberty Institute, requesting assistance from the Christian legal organization. Local legal office Covington and Burling LLP also became involved. This past week, attorney Robert Kelner sent a letter to Purdue on behalf of McCracken and the organizations representing the donor, noting that the university’s reasoning was flawed. Kelner noted that a number of government statements and practices reference God. In response, attorneys for the university again contended that the phrase would be considered government speech, but stated that they desired to continue discussions about the matter.